This is the new setup. hey man beautifull kit i like it alot..
Busy Busy! I love it! Two questions...do you have a front view shot? What's that bell you've got mounted in the center? I've always wanted a bell like that, but found that Zil-Bels have too much sustain for me. AgDrumma07 wrote: Busy Busy! I love it! Simply beautiful. 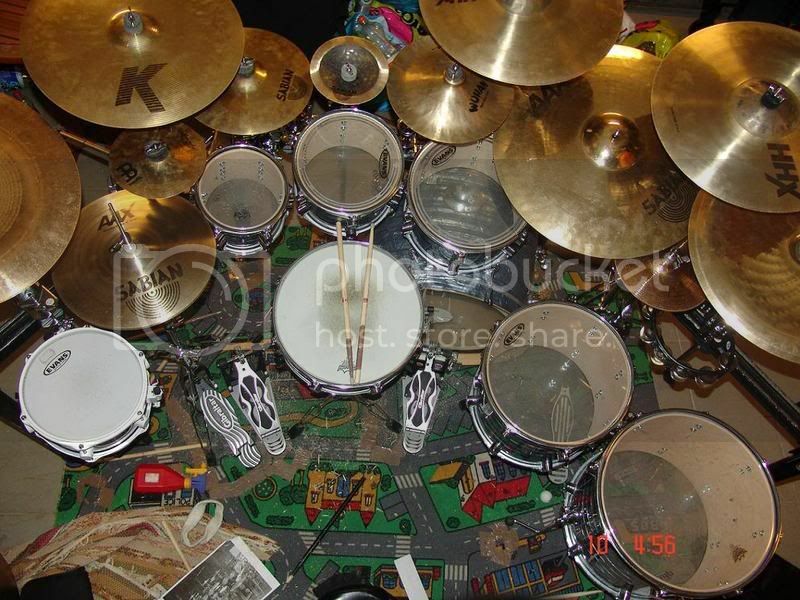 I must admit that I am super jealous of your cymbals. First things first love the rug! Second that is an amazing looking kit and the fact that your 14 and have 12 to 13 cymbals makes me hate you but I'll get over it. By the way What AA ride is that and the china on the far right what kind is that one? I love Cheese and drums wrote: First things first love the rug! Second that is an amazing looking kit and the fact that your 14 and have 12 to 13 cymbals makes me hate you but I'll get over it. Actually it's a Sabian Radia Bell Cup Chime 7"
whooo, sweet kit. Nice cymbals. Im aslo diggin that carpet too! hahaha!